Perhaps President Obama had a little too much Guinness yesterday. Shortly before he engaged in a ping pong grudge match with David Cameron, Obama and his wife, Michelle, took a tour of Westminster Abbey, where he signed the church's guest book. 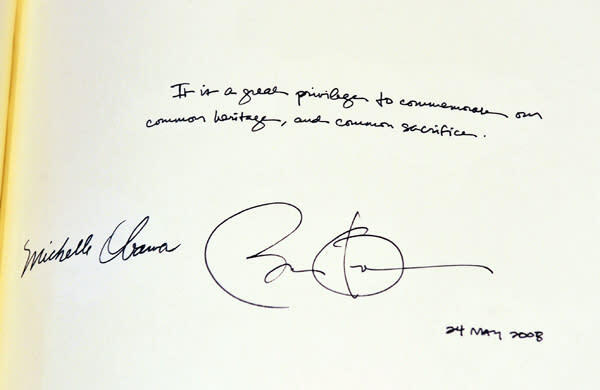 But, as you can see in the photo above, Obama incorrectly dated his message "May 24, 2008." No word from the White House on how the president mixed up his dates, though perhaps Obama was just remembering the good old days. As the Chicago Tribune's Mike Memoli notes, Obama was campaigning in Puerto Rico three years ago today.